WEB enabled graphical user interfaces that allow for remote control, monitoring and alarm notification via the internet. Pneumatic compressor and air station installation. Variable frequency drive installation and service. 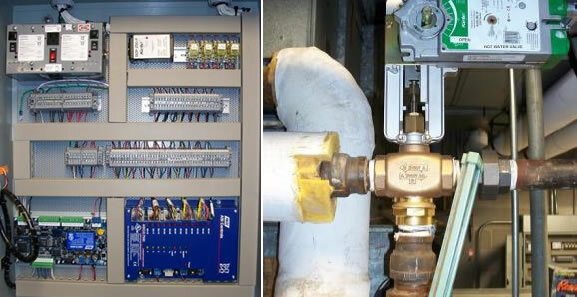 Installation and service of control valves for air handling systems and heating and cooling plants. Providing energy efficient control applications and retrofits to existing pneumatic, electric, electronic, and digital systems. Providing optimized comfort solutions in buildings with persistent control issues. Digital systems integration via hardware and software interfaces. Chamberlain represents ASI Control Systems - www.asicontrols.com. ASI provides a full line of interoperable digital controls for plant, air handling and terminal equipment. Chamberlain personnel are also capable of servicing and repairing various types of legacy systems by other manufacturers.